Greet your guests with this 15' tall by 12' wide entrance prop. 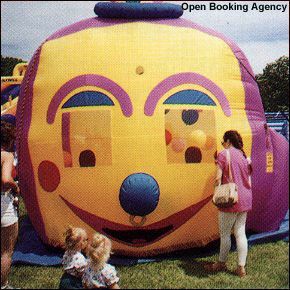 Our colorful clown sets the mood - children immediately climb inside and play in a whirlwind of balloons. Grab one and win a prize! An activity game promoting color recognition, motion, touch and coordination. Great for picnics, promotions and fund raisers.